After breakfast in the company of a Californian named Tom, who presented me with reasons as to why Elvis might not really be dead, I made for Krasnaya Ploshtshad', the Red Square. By the way, the word for "red" is the same as the word for "beautiful" in old Slavonic, so the color likely has nothing to do with the naming of this very old square. It is after the defeat of Napoleon that it became an object of national pride. 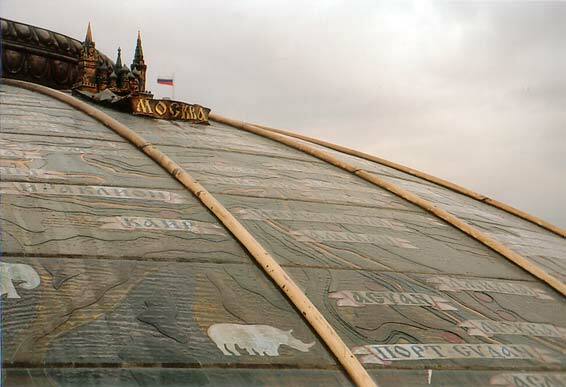 There used to be commerces along the Kremlin wall that were not rebuilt after that war, so that the vista on the fortifications was now open, and the other constructions bordering the square were studied in a spirit of prestige and monumentality. 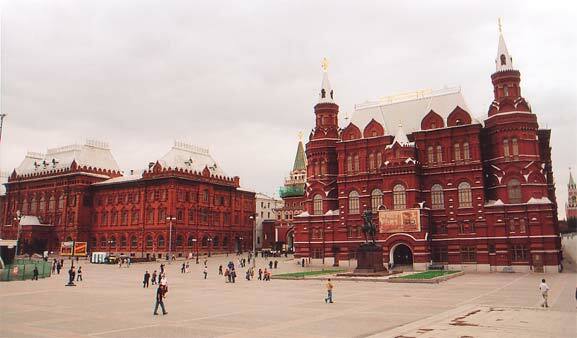 The State History Museum, for instance, which was my target for the morning, is the large, unmissable red building in pseudo-Russian style in the picture. Yet I actually couldn't find it at first. It was just too visible! Then again, after seeing the metro stations, I should have expected the unexpected, as the interior demonstrated again. 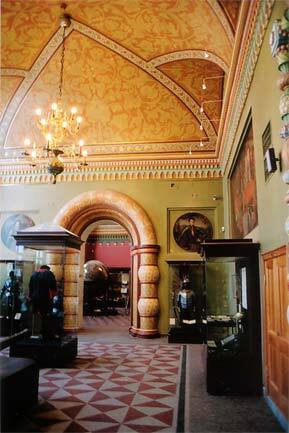 It is so ornate, it deserves as much attention as the showcased artefacts. For some reason Krasnaya was closed to pedestrians that day so I walked along the GOUM towards Basil's church. The GOUM, next to the very pink Kazan Cathedral, is the famous merchant gallery, impressive enough on the outside with its façade closely matching the Museum's, but even more on the inside. 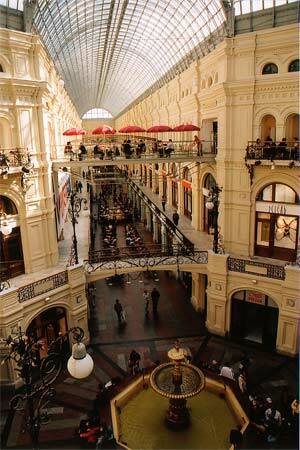 My grandma, who visited Moscow in the 60's and 70's, says that at the time the ground floor was for the common folk and the merchandise on display was "pathetic", whereas the upper levels were reserved for members of the Party and there champagne, salmon and all the good things in life were available in abundance. She observed that after she had managed to push a door she wasn't supposed to push, and took on her most wide-eyed-ignorance look when a guard came hollering after her. I only ever saw Lenin's mausoleum from a distance, and almost never noticed it at all, so well integrated is it despite its very different architecture. The architect, Shtshoussev, achieved both modernity and the expression of eternity, in sumptuous materials – yet one can't help thinking Lenin would roll over in his grave if he wasn't watched so closely. 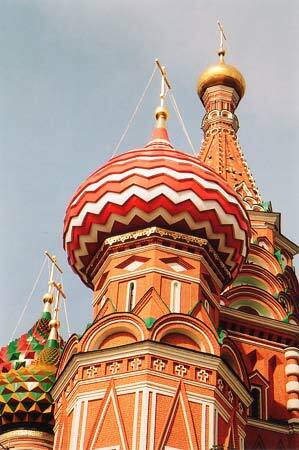 Finally I could admire this craziest of churches, Sobor Vassili, Basil's Cathedral. It looks like a frosted cake. I cannot imagine what cultural background led to the construction of something so playful and free, but I can imagine how stunning it must look when snow covers the land. I'm not sure why it is often called St Basil's in English, as that's incorrect – the man was never sainted, only beatified. It is strange at any rate that the cathedral is now known after him as he was merely buried in the 10th chapel. 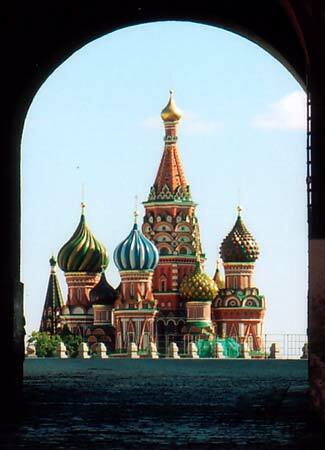 The cathedral was built by Ivan the Terrible to celebrate his 1552 victory over the Tatars. 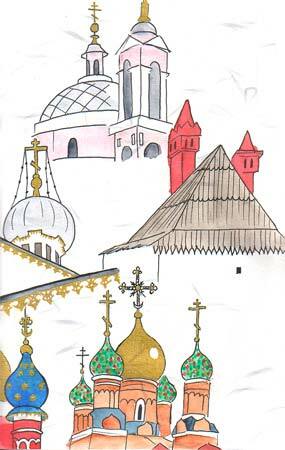 Its architecture is quite interesting: Ivan wanted to honour each saint on whose day something important happened in the campaign against the Tatars. For instance October 2, day of the final assault, is also the day of St Cyprian and St Justine. The result is an agglomeration of ten chapels. The main, central one is that of the Intercession of the Virgin on the Ditch, and its architecture echoes that of the church of the Ascension in Kolomenskoye – octagonal belltower with a chatior (small belltower). The chapels at the four cardinal points are reminiscent of the church-towers built by the Italians in the 16th century. 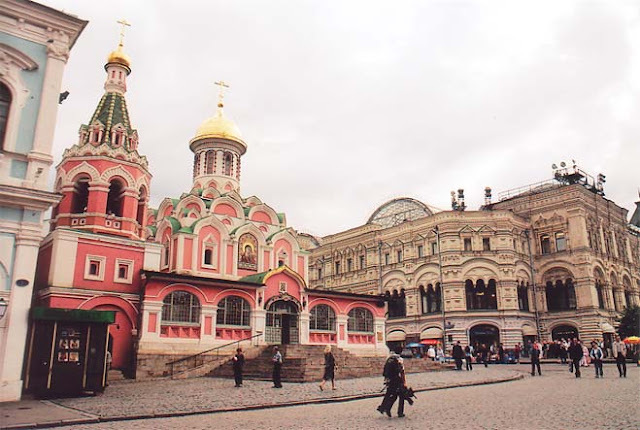 The diagonal chapels are the smallest but the closest to the Russian traditional style. St Barbara's Church, built in 1796 on top of a very old church. The bells of various sizes are rung in a lovely melody every day. The old Hotel of the English, 16th century, given by Ivan the Terrible to an English commerce company after the death of its owner. Church of St Maxim the Confessor. The Monastery of the Icon of the Virgin of the Sign (yes, the names are impossibly long, but trust me, you don't want me to give you the actual Russian names), founded by the Romanov in the 16th century (a couple of generations before a Romanov became the first tsar of the lineage), featuring a square nave with 5 towerlets evoking the Kremlin's cathedrals. St George's church, whose blue bulbs with golden stars I am in love with – let's note that St George, slayer of the dragon, is the patron saint of the city and is a recurring motif. Facing these historical beauties is the infamous, massive, scandalous Hotel Rossia the contruction of which must have wiped out a large portion of Kitai Gorod. I shudder at the thought. - Г is sometimes pronounced V instead of G.
- The cursive/italic for И is и. - The cursive/italic for Т is т. Don't ask me what Peter the Great was thinking. My next stop before heading for Druzhba again was Lubianka where there's a big bookshop: I was hoping to find books on traditional Russian dress. 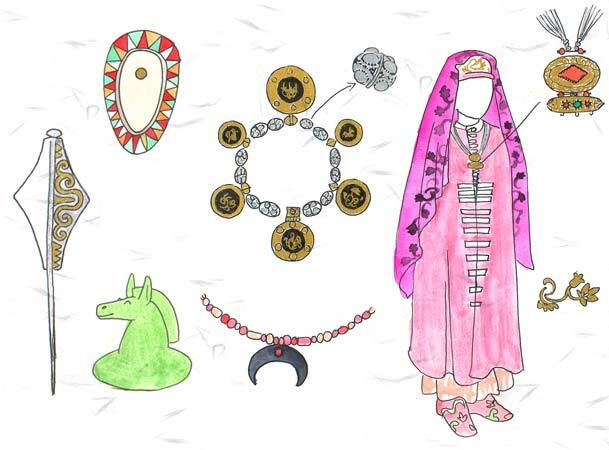 In my most atrocious Russian I asked for "kniga russii costyum" and was really surprised and charmed by the ensuing procedure: They sat me at a table and brought me everything they had on the subject! They kept piling up books while I leafed through each to find what I want. I didn't leave empty-handed. 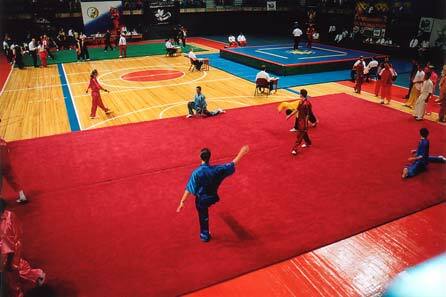 I was at the stadium at 3 to watch my friends perform, among others. The level was incredibly high. I played camera operator for them and left just before the opening ceremony (alas), because it was getting quite late and I needed an hour to get home.